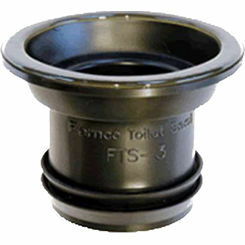 Take advantage of a huge selection of discount no-hub fittings at PlumbersStock. 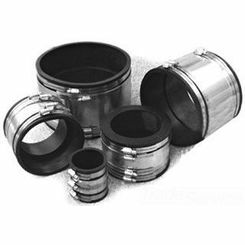 We carry a wide variety of fittings, including no-hub couplings, tees, and wyes to ensure you get the part you need for your project. 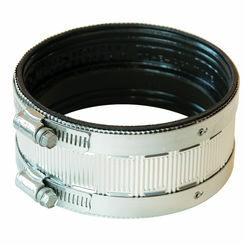 For a trusted brand, try a Fernco coupling. Their name has almost become synonymous with “no-hub” because of their quality products. We also carry Oatey, Cherne, JR Smith, and more. 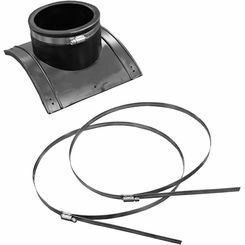 With hundreds of options for a variety of plumbing applications, PlumbersStock is sure to have the no-hub fitting you need to complete your project. 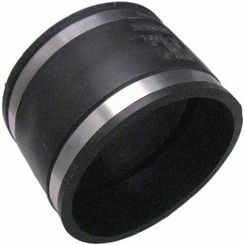 What Is a No-Hub Coupling? 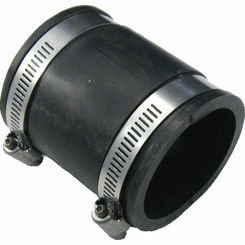 Also referred to as a “hubless coupler”, this fitting allows you to connect cast iron piping without the use of the hub and spigot. 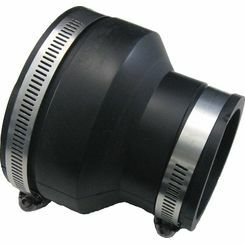 This allows for a more efficient solution, and an easier installation. 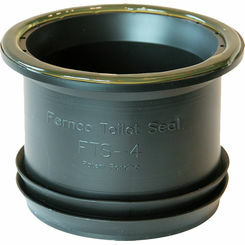 One thing that sets Fernco couplings apart is their patent provides the tightest fit for superior performance. 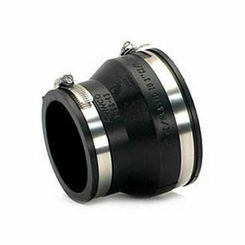 Almost all couplings are made primarily of cast iron or rubber, with plastic and steel used sparingly. 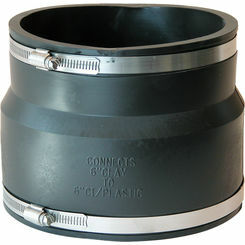 A reducing no hub coupling allows you to connect different sizes of cast iron pipe. 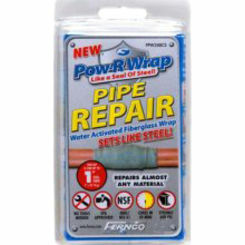 Reducing the water flow to smaller piping is a good way to increase the efficiency of your plumbing system. Whether you need 4” x 2”, or 8” x 6”, we have it. 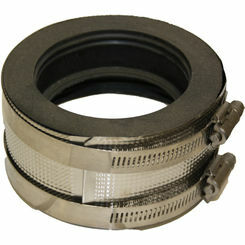 A non-reducing coupler, as you have probably guessed, connects pipes of the same diameter. 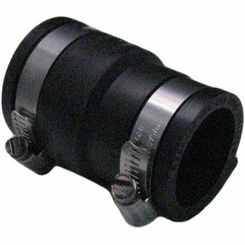 This is the most common application for no hub fittings. As mentioned, this popular brand has really cornered the market with their ability to deliver a quality product at an affordable price. 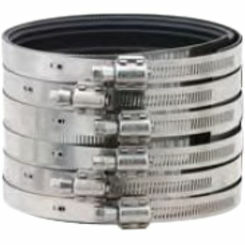 They classify their product based on install torque (inch pounds), number of clamps (or bands), and of course size. 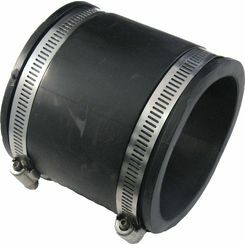 Standard duty Fernco no hub couplings range from 1.5” to a whopping 15”, from 2-6 clamps, and most sustain 60 IPs, but the 6 clamp models can handle double that. 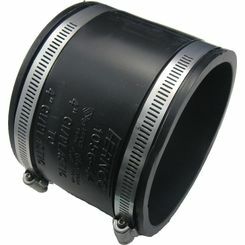 Medium duty rang from just 1.5” to 10”, offer 4 to 6 bands, and they all offer 80 IPs of install torque. 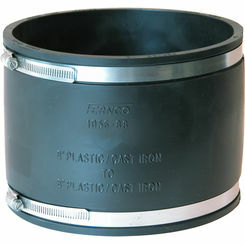 All Fernco reducing couplings allow for 60 IPs, and come with just two bands. 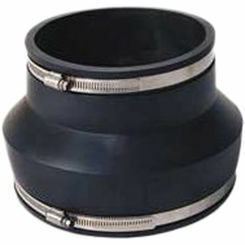 We carry no hub wyes and tees so that you can create a line off an existing cast iron pipe. 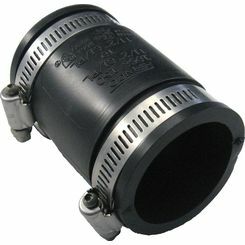 You can connect each to the new pipe with the appropriate sized no hub coupling. 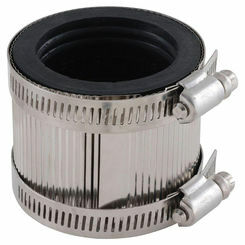 With the discounts we offer, you are sure to find the best no hub fitting for your home improvement task. 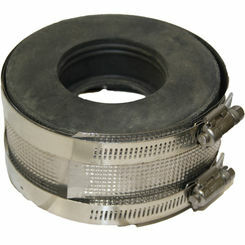 If you have any trouble locating the right part, please feel free to contact us. Our team of customer service professionals can help you understand what you are ordering and if it will fit your needs. 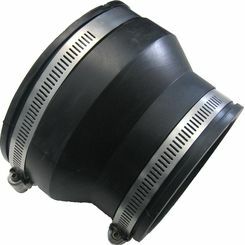 You may also use the filters to refine the product results to meet your requirements. You can sort by reducing, non-reducing, or other characteristics of the no hub coupling to make your shopping experience a more convenient one. Thank you for choosing PlumbersStock.